Great Grandmother Great Grandson • Pana Aloha Hawaiian Heartbeat • . 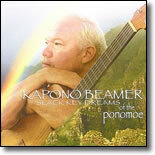 Kapono Beamer's new CD "Slack Key Dreams of The Ponomoe", is an awakening of creative forces. Always a musical innovator, Kapono explores new territories in songwriting as his artistry continually evolves. He is a multi Na Hoku Hanohano Award (Hawaiian Grammy) winning artist, awarded for his instrumental albums, "Great grandmother Great Grandson" and "Pana Aloha". He also won Male Vocalist Of The Year, Producer Of The Year and Contemporary Album Of The Year. He presents 10 original songs and 3 new arrangemants. Joining Kapono are jazz drummer Noel Okimoto and jazz bassist Dean Taba who impart an irresistable contemporary groove on Kapono's original compositions.